The voices of the doomed pilots of the First Great Air War speak from their diaries and letters home. 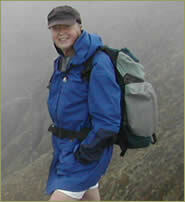 Ian Mackersey in New Zealand's Kaimanawa mountains. Ian Mackersey was a New Zealand writer and documentary film producer acclaimed for his deeply researched and revelational biographies. His first, published in London in 1985, and still in print, was the life of L T C (Tom) Rolt, the prolific author and pioneer of the leisure cruising industry on Britain’s inland waterways. He was inspired to write the book and research Rolt’s life from his own love of the English canals which he and his family regularly cruised in their own narrow beam boat from its home port in a London suburb. The first of his aviation biographies, Jean Batten: The Garbo of the Skies (1991), was a finalist for two New Zealand book awards. The story of the most reckless, successful and secretive of the celebrated long-distance women aviators of the 1930s, the biography – and a TV documentary Mackersey directed – revealed for the first time the truth about the sad and reclusive life of this glamorous woman pilot, solving in the process the mystery of her bizarre death in 1982. In 1999 Ian Mackersey produced Smithy, the first fully definitive biography of the legendary Australian pilot, Sir Charles Kingsford Smith, whose disappearance over the Indian Ocean in 1935 remains one of aviation’s great unsolved mysteries. It was followed in 2003 by a new study of the life of the American bicyclemakers who invented the aeroplane: The Wright Brothers: The Remarkable Story of the Aviation Pioneers who Changed the World. Both the Jean Batten and Wright Brothers biographies have sold international film rights. His latest book, No Empty Chairs, due for publication in 2012, is the story of the pilots and observers who fought in the Royal Flying Corps in the First Great Air War. A former head of film and television production at British Airways in London, where his documentaries took 24 international awards, Ian Mackersey is an ex-pilot, journalist, magazine editor, TV documentary producer and the author of ten books, including two novels. He began his writing career as a reporter on daily newspapers in New Zealand before going to London to work in Fleet Street and later as a feature writer for Royal Air Force Review, travelling the world reporting on the RAF’s global operations. There followed a year in Hong Kong as night news editor of the South China Morning Post, the editorship, back at the Air Ministry in London, of the RAF’s flying training magazine, Air Clues, and, later, a move to Central Africa. In Rhodesia (now Zimbabwe) he edited a monthly magazine for a copper mining group and established a documentary film unit in newly independent Zambia. His most successful film, Luapula Journey, which was accepted by the Edinburgh Festival and has remained a cult movie throughout Central Africa for more than 40 years, was a portrayal of a week in the life of a Zambian fish trader; the simple story unfolded entirely in the local Bemba language – with an English commentary for European audiences. Another of his films, Snow on the Equator, featured an expedition he made into the Ruwenzori, the fabled Mountains of the Moon on the Congo/Uganda border. Back in London Mackersey joined the public affairs department of British Airways (then BOAC) to manage its film, television and photographic operations, during which time he wrote and produced for world-wide television documentaries about airline operations, including three about the supersonic airliner Concorde. In 1983 he returned to live and work again in New Zealand where, in Auckland, he and his wife, Caroline, a former BBC-TV researcher, started a film production company to make documentary programmes for TVNZ. After writing, directing and producing several acclaimed and incisive documentaries, he turned to full-time writing in the early 1990s, travelling the world researching his books for his London publisher. In April 2015, after a short illness, Ian Mackersey passed away in Auckland. He is survived by three children; David, Paula and Kiri. Should you wish to make contact regarding their father's work, please email Paula Mackersey here.